Hopper automatically dumps when bumper release contacts the front of the dumpster. Hopper returns to an upright and locked position automatically after it dumps. 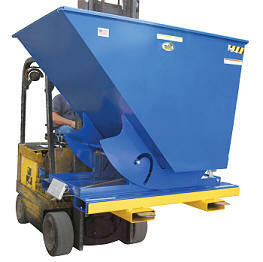 Also includes a cable that may be operated from the seat of the fork truck to manually dump the hopper. 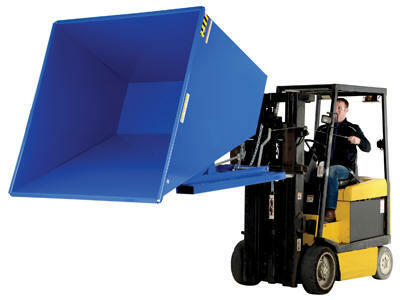 A safety restraint is provided to secure the hopper to the fork truck. Usable fork pockets are 7½"W x 2½"H. Optional leak proof design sold separately. D-25, D-33, D-50, D-75, and D-100 are stackable if you stack the top hopper turned 90° from the bottom. 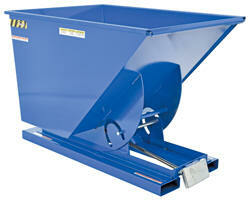 Blue baked-in powder-coated toughness standard with exception of models D-300-HD-NA, D-350-HD, D-400-HD & D-500-HD. Must be attached to fork truck when dumping. Identify your hopper quickly and easily with our universal color codes. 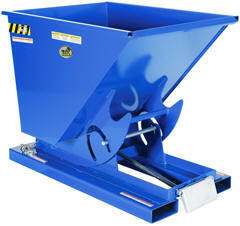 Specialty colors are available on any size/model hopper. Hot Dip Galvanized only available with suffix HD (Heavy Duty) Hoppers. Contact factory for specific model numbers and pricing. Sideways Tilt Option, model D-TILT, can be used with D-75-LD and D-100-LD hoppers only. User must obtain written permission from fork truck manufacturer prior to use. Factory or field installed. May still use hopper like normal. Adds 3-1/2." to height.